Fly me to the sun. Y’all already knew that I was on Team Qiao Ran, but this episode made it so much clearer that Chen Xun really isn’t the guy for Fang Hui. Yeah, yeah I know the whole “opposites attract” thing that happens in dramas, but she and Chen Xun are just SO different. Now with the introduction of Xiao Tang, Fang Hui just really pales in comparison. Where’s Qiao Ran at because Fang Hui is gunna need a shoulder to cry on…soon I think. Chen Xun and Xiao Tang are having a grand ol’ time chatting it up on the phone. She called him because all her roommates went home, leaving her alone in the dorm. Since she has no one to hang out with, she asks Chen Xun if he wants to hang out tomorrow and he quickly agrees. Okay, I know that all this is very innocent stuff…but we know something’s gunna happen soon. C’monnn. Chen Xun meets Xiao Tang at a fast food joint the next day, and he’s brought along one of his roommates, Shen Zhao. When they go to order food, Chen Xun and Xiao Tang both notice that Shen Zhao doesn’t have that much money and is calculating what he can afford. They team up to make it sound like Chen Xun wants to treat them to lunch. Because Shen Zhao is from a rural part of China that doesn’t have stuff like hamburgers, he purposely saves the food wrappers to mail home to his brother. After seeing this, Xiao Tang offers one of the clean napkins for him to send too. Dammit Xiao Tang, why you gotta be so nice? Kinda making it difficult for me to dislike you. When Fang Hui is back from Thailand, she asks Chen Xun what he’s been up to these past few days. He tells her that he just chilled around campus. She doesn’t seem too happy about his answer, but doesn’t say anything else. Chen Xun knows that she’s mad at him but can’t figure out why. When he hears that Leslie Cheung is having a concert, he decides to get tickets for it to cheer up Fang Hui. To make quick money for the concert tickets, Chen Xun finds a part-time job at a local pub. While he’s working, who should come up to him but Xiao Tang. Turns out that she also works at the pub as a singer. Girl’s pretty good! And Chen Xun apparently agrees with me based on how he can’t take his eyes off of her when she’s onstage singing. Later that night, Fang Hui hears from one of her roommates that she saw Chen Xun and Xiao Tang together on campus. Fang Hui pretends that she’s cool with it and tells them that she knows all about Xiao Tang. But when Chen Xun doesn’t show up for class the next day, she gets annoyed with him. Chen Xun doesn’t think much of it, but this is definitely just the beginning. Chen Xun, Fang Hui, and Jia Mo go to the prison again to see Zhao Ye, but the guard there tells them that he doesn’t want to see any visitors. Despite Jia Mo urging the guard to allow them to see Zhao Ye, he’s adamant that he doesn’t want to see them. When she goes to be by herself on the basketball court, that annoying Song Ling shows up. Because the guy can’t take a damn hint, she plainly tells him that she already likes someone else. He refuses to give up though even after Jia Mo flips out on him for asking where this guy is. Ugh, so fricken annoying. At work, Chen Xun accidentally spills hot tea all over his arm. Xiao Tang also happens to be there, so she gives him some soy sauce to put on his wound. Home remedy, I guess. Chen Xun asks her why she’s working here, and she says that she’s saving up money to go on a backpacking trip. Ah, she’s so cool! When she asks him the same question, he just says that he really needs money. Chen Xun and Fang Hui are hanging out, and he gives her a present to make up for angering her the other day. In return, she has some gifts for him too: a limited edition keychain and handmade gloves. She insists that he try on the gloves, but he’s reluctant because he’s still got that burn from the other night. When Fang Hui sees it, she runs off to get him meds for him and personally bandages it. That night at the pub, Xiao Tang is prepared to give Chen Xun medicine as well, but quickly puts it away when she sees that his arm is already bandaged. Did you use soy sauce on that? Chen Xun gets called out to meet his childhood friends because one of the girls is dumping one of the dudes because he’s poor but she still loves him. The situation quickly gets resolved when the dude begs her to stay with him. This was so dumb and unnecessary. 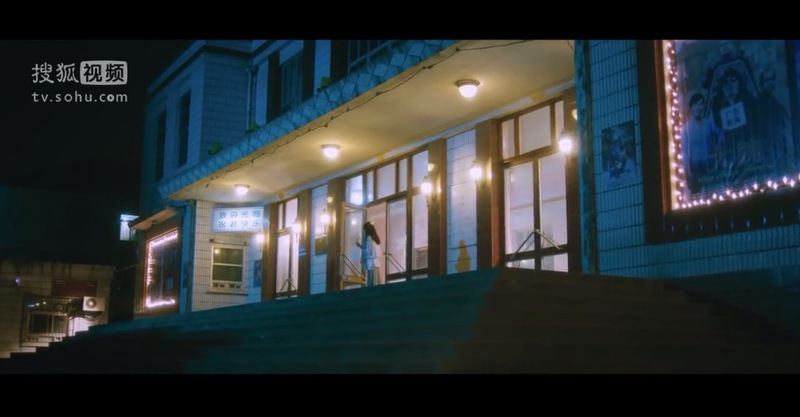 But because Chen Xun was busy dealing with this, he forgets to meet up with Fang Hui at the movie theater. Fang Hui ends up waiting there for Chen Xun for three hours because he doesn’t pick up her calls. When he finally shows up, he tries to explain but she doesn’t wanna hear it. Now Chen Xun gets annoyed because she keeps saying that she’s not mad when she clearly is. She asks him if he’s forgotten that he promised her that he’ll never make her wait or worry about him. Fang Hui starts walking away from Chen Xun, but he pulls her back into his arms. She’s crying and saying that he doesn’t care about her. He tells her that she can hit or yell at him, but she can’t say that he doesn’t care about her because she’s all he cares about. She tells him that she must be a crazy person to have waited for him all night. She wants to get closer to him, but she just can’t seem to catch up to his pace. Chen Xun tells her not to worry and promises her that he’ll always be close to her. I’ll wait 3 hours next time. Chen Xun asks his boss for an advance on his paycheck. Xiao Tang happens to overhear and asks him if he’s really that tight on money. He tells her that he needs the money for his friend, the dude who begged his girlfriend to stay with him, because they’re eloping. When they’re saying bye to him, Xiao Tang also stops by to give him some money. Apparently she was so touched by his story (uh, really?) that she wanted to contribute something. Chen Xun’s friends took that money with like zero hesitation when they didn’t even know her name. Chen Xun and Xiao Tang are having dinner together afterwards when they see the restaurant owner yell at an old lady for coming in to get out of the pouring rain. They decide to skip out on their tab as an act of rebellion. As they’re running through the streets in the rain, Chen Xun’s voiceover says that love is one big practical joke. Often, they would use love as an excuse to hurt the people they care the most about. They think that this is the only way to prove how much they love another person. Love should be a peaceful experience where they are running together. Hmm, well he’s running right now, but just not with Fang Hui! Chen Xun and Xiao Tang find a rooftop to stand under to get out of the rain. Xiao Tang tells him that his friends are quite romantic for choosing to elope, and he agrees. She asks him if he was to elope with a girl he likes, where would he go? Chen Xun tells her that he would go to the sun. He says that he’s not afraid of the heat as long as it’s with the girl he likes. Xiao Tang turns to him and ask what he thinks of her. When he asks her what she means by that, she asks him if he wants to try dating her because she’d go to the sun with him. Chen Xun hesitates for a second before telling her that he already has a girlfriend. Oh shoot, you didn’t know? Chen Xun was so busy having fun while Fang Hui was in Thailand that he quickly forgot his promise to send her a letter every day. When he finally remembers, he doesn’t seem all that enthusiastic about it. Song Ling signs up for a ballet class because he found out that Jia Mo is in it. Unsurprisingly, he makes a complete fool of himself. Jia Mo asks Fang Hui why Chen Xun got a part-time job, but Fang Hui didn’t know anything about it. Jia Mo advises her to keep a closer eye out on Chen Xun and what he’s doing. Sound advice, my friend. There was a legit “Greatest Pop Culture Hits of 2001” in this episode. Who wants to be Chen Xun’s girl?